Josh and his family are committed Christians. Joshua and his brothers were diagnosed with X-linked Lymphoproliferative Syndrome (XLP) back in November 2003 after suffering from acute anaemia. 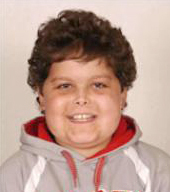 The only cure is a bone marrow transplant which Joshua started in June 2004. The transplant has gone well with a few hick ups along the way and it is hoped that he will be home in the next few weeks. The transplant is a cure and once stable it is expected that Joshua will go on to live a full and reasonably normal life. Joshua is the first of the 4 brothers that have to go through this procedure and he has been extremely brave and courageous. Indeed he has already volunteered to be the ‘third adult’ on the transplant ward during the subsequent transplants for his brothers. He is very fun loving, has a great sense of humour and is extremely caring and gracious to others. Indeed it has been a privilege being with him during this difficult time. Always a smile on his face. Positive news for Joshua in that his bone density is now almost back at the bottom of the normal range. There is now also a plan being put forward to take him off the last small dose of steroids he is on. However, his scleroderma is still active – particularly on some areas of skin. Joshua has definite better joint movement in the hips and knees compared to six months ago, but there has been no improvement on the ankles and arms. Very positive news for Joshua after his ‘scare’ last week – his bloods on Tuesday show that everything is back to normal – a great relief. We are still no wiser though to knowing why his Hb level dropped so quickly. The plan now is that he will have bloods every two weeks and they will monitor the levels. Encouragingly, last week Joshua did have EBV in board (EBV is the glandular fever virus – which XLP boys have no resistance to and is life taking) with a moderate count of 15,000. This week it is gone – the new immune system is working well. And this Sunday should be a wonderful day (all of the Hartleys will be there) as we have the first XLP RT Triathlon. We have 27 teams battling it out over a 3.5 mile run, 16 mile cycle ride and a 0.5 mile swim! Joshua has recovered well from his infection and has been back at school all week. We should be live on GMTV (ITV1) after 9am tomorrow (Monday) morning. Sorry its short notice. And we should be in the medical section of the Daily Mail this Tuesday. However, he is much better today and we hope that he will be able to come home on Monday – his 15th Birthday. Unfortunately it does mean that he will miss his birthday treat, we had booked tickets for us all to go to see the ‘Lion King’ in London, Allison will be taking the other 3 boys up. Joshua’s battle continues. He now has shingles on a painful part of his bottom. Shingles can be very serious for a child shortly after their BMT but are not serious for Josh – just very, very painful. He is now back on our favourite drug aciclovir and he does seem a little better this morning. Once again, thank you to our elves, they made christmas that more special. It’s definitely been a better year for Joshua this than last. He did very well in his SAT’s over the summer and has now settled in to start working on his GCSE’s. Medically there has only been a little sign of GVHD – Joshua now has some hair loss – but the main development is that he now has ‘Scleroderma’ also known as ‘hard skin’. This is excess collagen deposits that can affect the skin and joints and is caused by GVHD, Joshua starts a new once a week course of medication – which could go on for… 2 years! This is limiting his mobility and can be very painful at times. Joshua is doing OK. He is now well into his course of treatment for Scleroderma and he believes that his ankles and knees feel better. Allison took him up to GOSH last Wednesday and they were very pleased with the initial progress made, his skin looks much better. He continues to enjoy school although changing classrooms is a real battle for him with the push and shove of the crowds. Joshua should also restart his immunisations in January – proof that his immunity is very good now. Joshua has now started his new medicine to help with the Scleroderma – we have been told to wait from 3 to 6 weeks to see some improvement, so it’s still early days. Mobility remains the big issue. He will also be going to GOSH this Wednesday as his port is not bleeding back properly. On Thursday 26th October our Home Church will be holding a day of prayer and fasting for Joshua. We now need to see a final end to this long journey he has been on. Members of New Life Church in Romsey will receive a pray sheet next Sunday – but if you would like to join with our local church family, then please email and I will gladly send you a sheet. A number of folks have emailed me back asking why only Nathan and Daniel are ‘Walking the Test Way’ this weekend – this is the reason for Joshua and we expect 6 year old Luke would spend at least 4 miles on his Dads shoulders. The forecast for the weekend is good and once again thanks to all you kind folks who have sponsored the boys! The battle going on in Joshua continues. Over the last few months we had not seen any great signs of the chronic GVHD (Graft vs. Host Disease) which has been plaguing Josh over the last 28 months since his transplant. Unfortunately it would appear to have flared up again on his skin with some bright red patches on his lower legs. Fortunately one of the many creams that we have seems to have dulled this and it has not spread further. However one side effect on this is that his knees are now very sore – this is possibly due to the tightening of the skin following the GVHD. So he is back up to GOSH next Wednesday. Allison took Joshua to GOSH today and again all is moving in the right direction. Because he is now on a very low dose of steroids his immunity has recovered enough so that he now no longer needs to have his immugloblins. Good news on his bone density too – a year on from being diagnosed as being 3 standard deviations from the norm, his bone density is now just below normal. Wonderful. So he will hopefully shortly stop these infusions as well and possibly cut down on the calcium supplements he has to take with every meal. Just 6 more weeks of steroids to go and then hopefully off those too – for ever! Joshua is now much more mobile with the weight still coming slowly off. Next week should be an interesting challenge as I am taking Nathan and Joshua camping for a week. Joshua is now finally loosing weight – down 4kg over the last two weeks. This is about the right rate of decent in terms of weight loss – we don’t want to see it come off too quickly – but we do want to see it come off! He is now just on a small dose of steroids every second day and there is no visible sign of the graft vs. host disease. Joshua is still on a small dose of steroids but disappointingly we have not seen the weight drop off as we have seen previously. Last week he went in to hospital to have his 3 weekly immugloblins and because he has been so ‘pricked’ and he has put on so much weight it took them a very painful hour to find a vein. So this Wednesday afternoon he will be going up to GOSH to have a ‘port’ put in. This will be a small operation to put a skin type port under his arm to make access to veins that much easier. Typically I am away on business that I cannot move so the responsibility again rests with Allison to get him up to London and back… However his GVHD seems to be OK at the moment, although he does now appear to have some hair loss. It’s been a tough 2 years for Joshua. Joshua is now on a low load of steroids following last Autumns flair up of Graft Vs Host Disease (GVHD). He still has a lot of weight to loose and it is still not clear if the graft has finally settled or not. Joshua is getting better. Importantly he is now coming slowly off the steroids and he is starting to loose weight. His weight gain has been the big issue this time around. At the bottom of his transplant he was just 28kb, at the top of having steroids his body weight has nearly doubled. This had impaired movement, and just generally grotty feeling. He was also having some pain in his knuckles when he wrote but a new medicine seems to have knocked this on his head. Josh is doing ok. He had his MRI scan at GOSH last Monday and we finally heard the results last Thursday. There has been little change to the inflammation (possibly a slight increase in one area) but as neurologically he is 100% ok they have started to reduce the steroid dose he is on. This is positive news for Joshua as the steroids have meant that he has put a huge amount of weight on – he should start to lose this now. He does now occasionally have problems with what seems to be arthritis in his knuckles on both hands – at times almost bringing him to tears with the pain. He is seeing a specialist on this in just over a week’s time. Joshua will also be in hospital during the day on Monday to Wednesday when he has his regular 6 week infusions to help increase his bone density (the other bad side effect of his steroids). He remains though the most wonderfully positive young man. For those in the UK please don’t forget to watch Songs of Praise this Sunday (BBC1 – 18:10 GMT) – it should be interesting! It’s been a real mixed year for Joshua. He had the joy of returning to school in the spring, a wonderful summer and then it all went ‘pear shape’ in the autumn. Joshua is now back on steroids and this has really helped settle down the Chronic GVHD (which he has now been officially diagnosed with) but we also know that this is ‘bad news’ for his bone density. He is pretty good at the moment and has enjoyed having all his brothers around him over the festive period and he is now the very proud owner of a Hornby Train Set! The hope for early 2006 is that we can reduce the steroid dosage, see the chronic GVHD go away and build his bones back up – and then importantly get him back to school. I have never met a young man so desperate to get back to school! Joshua remains a young man of deep faith, undying love and great courage. Please continue to pray for Joshua – he has ongoing problems with his joints due to low bone density – it can be very uncomfortable at times. The great news is that Joshua came home on Monday evening from Southampton General Hospital. He is doing very well but is unlikely to return to school until January – when we know that his immune system is back up functioning properly after the recent steroids he had to take. Joshua is in the process of overcoming the next hurdle. Unfortunately last Sunday it was clear that he was getting short of breath and so has been admitted to Southampton General. He has ‘PCP’ which is the fore runner to pneumonia. He became susceptible to this after the last dose of steroids – and he is now on steroids to help dampen down the situation. The +ve news is that he would appear to be over the worst – the Drs are pleased with him. So we now have to deal with having two sons in two separate hospitals – although we have been told that Joshua should be home again shortly. When he comes home he will be placed in bubble wrap and never allowed out again (joke). Thanks for your prayers – the messages we get from everyone across the globe are a real encouragement and blessing. Joshua is doing great at home and will hopefully be going back to school for the morning this thursday. Joshua is now home and just about fully recovered from his infection. It would appear to have been a flair up of the virus on the brain that he had during his transplant. The medicine used to ‘put him right’ was stopped about 3 weeks before the flair up. His short term memory has recovered and we are now working on replacing some of the lost muscle that the steroids he has been on have wasted away. We hope he will be fit enough to return to school in a few weeks. Joshua is not well. Indeed he is also now staying up at GOSH. Allison brought him up for the BMT clinic today and when they saw how he had lost some of his cognitive reasoning (can’t finish sentences, short term memory loss) they immediately readmitted him. It is highly likely that he has a virus in the head similar to what he went through 15 months ago during his transplant. 5 weeks ago we stopped a drug that specifically addresses this so this is the likely outcome and if it is should respond well to treatment. They are restarting the drug this evening and he will have an MRI and other tests in the next 48 hours. They also found out that he has low bone density which is probably what is causing the ankle and kneed aches. This is due to the length of time he has been on steroids but is treatable by a regular 9 week IV infusion. There was some ‘good news’ mixed in with some bad for Joshua. The ‘good news’ is that the problems that Joshua was having with his liver and graft versus host disease has passed – these results were all good. But he is now back on steroids (quite a small does) as x-rays taken earlier this week at GOSH showed that he had some inflammation around his knees and ankles – part of skin graft vs. host disease. We do need this to ‘go away’ so that we can concentrate on Nathan’s transplant. Unfortunately Joshua is also far from being himself. For the last 10 days or so he has found it difficult to sleep and so has had a few days off school. He also has some stiffness in his knees which we understand is due to him being on steroids for such a long time. Plus he also has a urine infection. So this Wednesday he will go up to GOSH for a full review to try and work out what is happening. His blood and other measures look good through – we don’t think it is the liver GVHD but do need to get him right before Nathan goes in. On Monday Joshua will be in GOSH having his PEG removed (this is a tube that goes straight into his stomach and through which we can push drugs etc.) As of today he is now down to just two drugs twice a day – and happily takes them orally. Joshua remains well and is coming off his steroids very slowly (again). At his last day of school he was somewhat shocked to be called forward by the Head Master and awarded him the Diana, Princess of Wales Memorial Award for Young People. The events in London yesterday were truly horrific – our hearts and prayers go out to all those affected. Only 24 hours earlier we were driving up to Great Ormond Street Hospital along the road where the bus was bombed and past Great Ormond Street Hospital. And the bone marrow transplant team who look after our sons heard the two blasts. Joshua has responded well to the small dosage of steroids and his liver function tests are all heading back towards ‘normal’ again. He has been back at school for the last two weeks. Ironically he was on a school coach yesterday heading for a visit to the Bank of England and St Pauls Cathedral – but the coach turned round. We had hoped that Joshua would have finished the majority of his meds two days ago. But at the start of the week he clearly was not too good, hasn’t made school and it has been confirmed today that the Graft Vs Host Disease of the liver is back. So he is back now on the steroids, although a relatively mild dose, and hopefully this will clear it up. It reminds us that whilst the bone marrow transplants are life savers and a cure for XLP, they do leave the new immune system very open to disease and infection… It will take 2 plus years for their immune systems to relearn – an awful long time. We have been waiting for a while now to get Joshua’s CD4 counts up (a subset of his white cells). Once these reached the magic figure of 300 we can reduce his medication dramatically… And this week they shot past the winning post at over 500! So a week this coming Wednesday he stops the majority of his medicines and his 3 weekly immugloblins – wonderful. And last Wednesday (8th) was the anniversary of his transplant. The Walk 4 Life on Sunday was fabulous. Some 700 folks turned out and the estimate is that a total of over £30,000 has been raised for the Anthony Nolan Trust. We are made it around although it was a bit telling on the kids towards the end. Joshua was a complete star and recorded several interviews on his way around – for those in the South of England he should be on BBC South Today tonight. Joshua went to clinic at GOSH today, they are very pleased with his progress and immunity and we now have a plan to get him of the majority of his meds in 5 weeks time – which will nearly be the anniversary of his transplant. Joshua is great – very happy and loving the freedom of being back in the community. Joshua went back to school a week last Monday. He was suppose to just stay for 3 mornings (Monday, Wednesday and Friday) but actually did the full week! and all of this week so far. And the reception he his had from his class mates has been great – a real credit to the school. He is very happy to be back – and very enthusiastic. Joshua has gone back to school today… He has continued to recover well from the GVHD of the liver and last week the Consultant at GOSH said that it would be OK for him to go back. He will be broken back in gradually. He was deliriously happy this morning and left quite early – so was probably the first one there. We remain mindful however that it will take up to 2 years for the immune system to relearn and catch up. Joshua is currently at home so he has got time on his hands, he says he is very happy to send thank you cards and e-mails so if you are sending a letter/ card can you please if you have one write down your e-mail address. Please continue to pray for us all – especially for Allison who has lost some hearing in one of her ears. She puts this down to the whirring of machines in hospital, but 3 weeks after Daniel coming home from GOSH she has not recovered. Joshua seems to have made a good recovery from the liver infection that he had. His eyes are ‘near normal’ now and he is eating and drinking well. Today Joshua became a TEENAGER. No sudden change but a joy that he has reached this land mark age. Amongst his presents was the start of a new course of steroids as yesterday it was diagnosed that he has Graft vs. Host Disease of the liver. The consultants are confident that this will clear it up but it does unfortunately mean that going back to school is now on hold – with a proposed target date from the consultant being after Feb half term… The good news is that his new immune system is ‘excellent’ but this new course of steroids will ‘dampen’ it down. Already after just one set he seems better… swings and roundabouts. The down side is that it looks like he has a liver infection which is making him very tired – so he came home just after lunch. But he is deliriously happy about being back. We are waiting a call from the team at GOSH to agree next steps re the liver infection (bloods were taken today) – we should get this tomorrow. Daniel is home and doing extremely well. We now have a (hopefully) normal period of family life before Nathan goes in for his transplant – scheduled at the moment for the end of April. Joshua is still on target to return to school fully in the next 2 weeks. Thanks for the wonderful support. It is almost certain that Joshua will be returning to school on the 18th of this month. This very much signifies the ‘end of the road’ for Joshua with regards to XLP. Whilst he will still be on some medicines and immugloblins for some time yet, going back to school signifies that he can get back in to public life. He will have to have all of his baby and child jabs again and now actually needs to loose some weight. The later I never thought I would say about Joshua, as he has always been a rake. At the bottom of his transplant he was down to 28.5kgs but is now up to 45kgs, even putting on weight after finishing steroids. The elf’s and secret Santa’s went down very well in our household(s). Joshua remains well and we have just had confirmation that his graft remain 100% donor (hurray). It is now planned that he will go back to school in the New Year. Joshua is still very very well – and is contemplating setting up a cakebaking business (follows from his Mum). Any orders please email him, link is above. Joshua remains well and we will be taking him to clinic at GOSH tomorrow (Wednesday) and he should also be able to see Daniel for a short time. Joshua is doing very well. His weight continues to go on and he is full of life. The steroids are being reduced now, they are now half the dosage he was originally prescribed and the dosage will fall again weekly. Thanks again for your great support and encouragement. We went up to see the consultants at Great Ormond Street today and all pretty positive. Joshua is now home and doing really well. It was as suspected a case of Graft vs. Host Disease – very mild. Joshua should be home tomorrow (Thursday) as we had a mad dash to London from Southampton General last Friday to confirm that it is Graft vs. Host Disease and now that he is well through a course of steroids he is very much better – big relief. He will have a check up at GOSH on Wednesday. Joshua remains in Southampton General with the diagnosis unchanged. Tomorrow (Thursday) he will go down to theatre for a minor op to reinsert his Hickman line as it has slipped and they are having problems drawing back blood. They also intend to take some biopsies of his bowel at the same time. Joshua is still in Southampton General and is likely to be there for a few days more. After an initial (wrong) diagnosis of constipation they believe that what is going on in the stomach and bowel is likely to be a combination of GVHD and the ongoing soreness of his stomach – possibly with a bug on board. He is OK but very tired (nights are quite disturbed). Please pray that we will see an end to this and that he can get back on with his recovery. We always knew there would be ‘swings and roundabout’. Joshua was doing very well until Wednesday morning when there was clear swelling in his hands, some high temperatures and the sign of the Graft Vs Host Disease rash…. So he is tonight in Southampton General Hospital so they can keep an eye on him. Hopefully he should be out over the weekend. It has been confirmed that he has mild GVHD. It’s a real shame as it seemed to us that Joshua had ‘turned a corner’ the week before with only occasional sickness and great weight gain. Nathan may also be admitted due to EBV virus, and Daniel is having his treatments at GOSH. So it’s a real battle in our household at the moment – I think we feel that we can fight one battle at a time but not two or three together … welcome your prayers as always. It’s now an amazing 14 weeks since Joshua’s transplant (D+98) and he continues to do well, with some sickness still. We’ve just got back from clinic in London and they are pleased with the progress he is making. He has put a little weight on (although still some way to go) and the various levels remain good. They are gradually reducing Joshua off some of his meds as well. http://www.bbc.co.uk/cbbc/bluepeter/contact/badges/ Joshua in particular is ‘over the moon’ and rumour has it that he even wears it on his pyjamas (only joking Joshua). Joshua has been home now almost two weeks and continues to do well and put some weight on. He still needs a fair amount of nagging to get his special diet down him – no change. Yesterday we drove up to clinic in London (we thought the drive would be a nightmare but amazingly we arrived 1.5 hours early!). This also went well – overall very +ve. There are some concerns that he might have a slight ‘bug on board’ which is contributing to occasional sickness so he now has additional anti biotics. Just wanted to let you all know that Joshua arrived home on Friday. He is very well, very pleased to be home and fitting right back in with the other boys. The Consultants at GOSH were very pleased with the way the transplant went, that he remains EBV free and that the ‘milk type’ diet he is now on will give him all the nourishment he needs plus also help soothe his inflamed stomach. It is really impossible to put into words the emotions that we went through driving him back from London on Friday. We are just so grateful that he has come through and that he is doing so well. For the next 4 to 5 months Joshua has to stay away from places where there are lots of people – church, school, restaurants (all food once he is back on has to be tightly controlled), cinemas although Dad has said that he can go and see Southampton FC play as there are not many people there. Before Joshua came home he received a special injection of T Cells from Texas! Before transplant Allison (his Mum and his donor) gave blood which was sent from the UK to Baylor College of Medicine who were then able to extract from Allison’s blood the T Cells that she has to combat EBV and basically they replicated them and made more! Whilst it is still at test stage none of the 70+ test subjects have gone on to develop Lymphoproliferative Disease (LPD) post transplant. There will be a fair amount of UK media interest – we should feature on BBC South Today and Meridian Tonight and we also know that Sky News have asked for footage as well…… and there should be a large feature in the Baptist Times this Thursday! To those of you who have stood in the gap with us over the last few months – thank you. We have known the almost physical manifestation of prayer support helping us through some tough times, and the hand of the Master soothing our brow. As Joshua nears the end of his journey we know that we are very much as a family still at the start – with the other three boys still awaiting their ‘call up’. However it is not very serious and a decision will be taken on Thursday afternoon about him coming home – it will either be Friday or early next week. Our house is probably the cleanest it’s ever been – and a large gazebo now stands in the garden to allow Joshua to go out without being in sun light. Joshua is likely to be in GOSH for around another 21 days. Since he came in over 2 months ago he has lost a lot of weight and they are keen to get to the bottom of it. He will be ‘scoped’ on Wednesday with results back by the end of the week. A course of treatment will then probably take 2 weeks. We were all hugely disappointed with plans at home for the homecoming well developed – now well on ice. Joshua remains in good spirits though and was pleased 2 see me (I’m sat with him now). He knows how important it is to come home well. Please also spare a thought for Daniel who will be come a ‘true Jew’ on Wednesday – necessary preparation before his transplant later this year.